The Silver Bullion held by the Liberty Dollar Network will be audited monthly to ensure that it is accurately represented by the total amount of eLD and Silver Certificates that are in circulation, including that held by the Liberty Dollar Network in reserve. 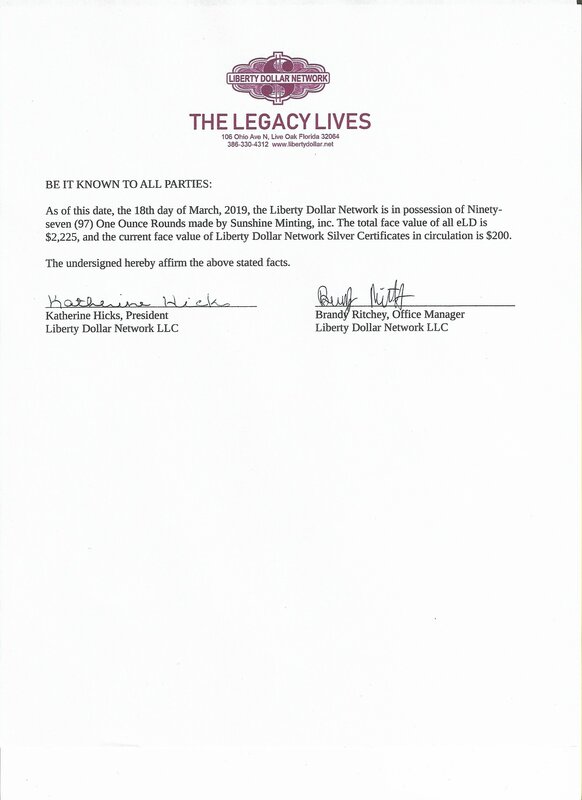 As of this date, 03.18.2019, the Liberty Dollar Network LLC has a total of Ninety-seven (97) Ounces of .999 Fine Silver Rounds from Sunshine Minting in its physical possession, as evidenced by the internal audit performed by Kathy Hicks, President, and Brandy Ritchey, Office Manager, which is available for viewing HERE. Because the Liberty Dollar Network is only just beginning, all of the silver is stored in a very secure safe at our offices. When we reach a total of Five Hundred (500) Ounces, this will change, and the Silver will be stored in a bonded precious metals storage facility, and that silver will be audited independently and certified once each month. The silver kept on hand at our offices will continue to be audited internally. We maintain insurance that is sufficient to guarantee against loss of the silver stored with us, and that which will be stored separately will be insured and guaranteed by that facility. Each month, we will publish the results of all such audits on this website.